Bengaluru, the capital city of the Indian state of Karnataka is tagged with a globally recognized title; the ?Silicon Valley of India?. Identified as the largest software exporter, the city is home to multinationals as well plenty of start-ups. This favourable situation thus proves to be an impetus for the rising number of career opportunities that the city offers attracting indigenous and foreign professionals to make it their home. What is the course all about? Agile is the latest and preferred technology. Scrum development encourages developing short ?sprints? that are developed, tested and revised in steps. It provides an independent code for each module. When editing the code of one module, other modules remain unaffected and need not be tested again. This is one advantage of the Scrum that makes it the perfect choice for professionals across all domains. To keep pace with latest technology trends, it can be a wise move to sign up with KnowledgeHut?s CSD certification in Bengaluru. CSD course in Bengaluru is a comprehensive course that covers basic and advanced features and principles of scrum framework. The second phase CSD training in Bengaluru provides technical training and practice sessions by industry experts. 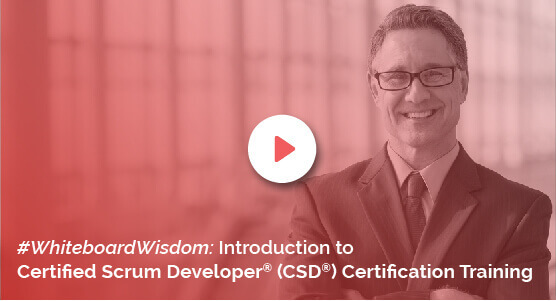 Benefits of the course: CSD training in Bengaluru is designed to train developers in scrum framework and provide them with hands-on knowledge on its technical implementation. CSD Certification in Bengaluru provides CSD certificate credentials to trainees; the result of a successful course completionwith fundamental and technical knowledge in using scrum framework. KnowledgeHut also provides comprehensive course material, downloadable e-books and 100-days free access to agile and scrum e-learning program. The KnowledgeHut Way: Certified Scrum Developer Certification in Bengaluru by KnowledgeHut comes with a very low fee which covers the cost of Scrum Alliance Certification Examination. This way, your move to enrol for CSD Certification in Bengaluruwill come as a small investment for a bright career ahead.